This noise generator has simple sketch, but lot of fun. Also, source of noise for acoustic experiments. In the example above, I am using already “populated” breadboard with lot of wires – you may chose any two pins and declare it as output. 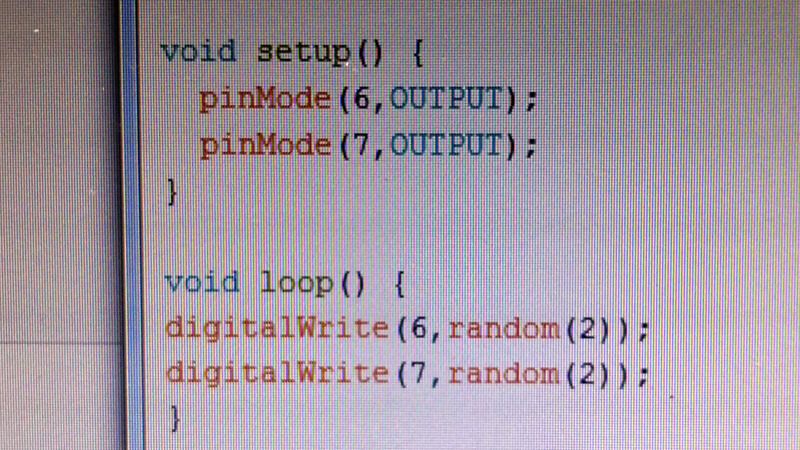 Then use simple instrucion: digitalWrite(pin1,random(2)); or in the case you want single pin and ground, make it with just one command. Or, you can use say 6 pins, connect in series 10 kOhm resistor, and connect from all 6 pins to single point and feed into audio amplifier as needed. Example above using passive piezo speaker, without oscillator inside. It is possible to use active one, but it has oscillator at about 2.6 kHz, so this frequency will dominate. Or some “normal” loudspeaker. Arduino has overcurrent protection, so you are safe. Even AttinyXY (for example Attiny85) can work with this code. Just need way to program it.